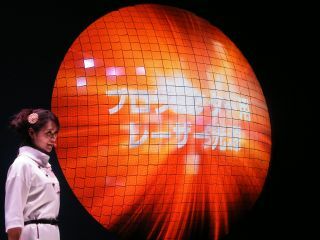 In the battle of the booths at CEATEC 2011, Mitsubishi has managed to win the (TechRadar patent pending) 'best display' award, combining nearly 700 curved OLED panels into a virtual globe. The display showcased Mitsubishi's focus on curved OLED technology and could well point to a future where this technology is used in signage and the like. The OLED display comprises 696 OLED panels which measure 96 x 96mm each, with the entire display 2.7 metres across. The name Mitsubishi has given to its OLED technology is Diamond Vision and is the same technology that the company has been pushing since 2009. Back then it showed off a 155-inch television made up of the panels. They have improved the size, however, as the 155-inch TV was made of 3mm squared sections of OLED slotted together – this time an extra two inches has been added. As for the curved aspect of the panel, this was something that was first demoed back in February at ISE 2011. Mitsubishi isn't a big name in the TV world in the UK, but we are starting to wish it was. Alongside the OLEDs, the company is pushing its Laser Displays, which TechRadar is already pushing as a heavyweight in the home cinema market.